Do you feel safer today? Let’s hope so, since you’re certainly less free to travel about the Northern Hemisphere. 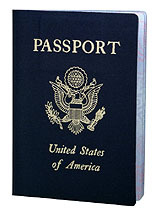 Beginning just after midnight, every American returning from Canada, Mexico, and various island paradises now have to flash a U.S. passport to get back in the country. For the 70 percent of citizens who don’t have passports, that means a minimum four to six weeks waiting time (and probably more, given the new filing rush) to legally escape the national boundaries. Great. My passport is expiring in a couple of months and I downloaded the forms just yesterday to get it renewed. I didn’t realize I was going to get caught up in Phase 2 of the great Canada/Mexico passport debacle. Thanks for warning me just in time, Matt. Of course, this is only a partial change. I learned to my chagrin some years ago that at least some Canadian border officials have wanted to see a passport all along. Flying into Toronto in the mid-90s, I got hassled by a security guy at the airport for having only a driver’s license to prove my bona fides (“that doesn’t prove citizenship,” he said, “it just means you’re licensed to drive in California,” which, admittedly, is perfectly correct). He still let me in, but I’ve made sure to take my passport on trips to Canada ever since.